University College London Hospitals NHS Foundation Trust (UCLH) has commissioned London South Bank University (LSBU) to evaluate and helpimprove its support programme for newly qualified health professionals within its hospitals. In UCLH's perceptorship programme, experienced health professionalsprovide personal and professional guidance to newly qualified health practitioners including allied health professionals, nurses and midwives. "It is well known that nurses and other health professionals find the transition from student to qualified practitioner a daunting experience. It is really important to make sure they have the right support to develop their confidence and competence," said Professor Lesley Baillie,Florence Nightingale Foundation Chair of Nursing Clinical Practice at LSBU. 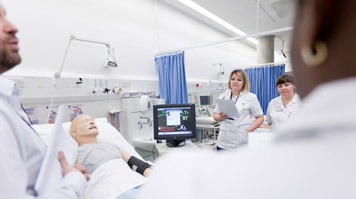 LSBU's team from the School of Health and Social Care will provide a deeper understanding of the programme to improve its effectiveness and will develop a suite of online learning materials, including videos shot at LSBU's innovative healthcare simulation labs. The team will also pilot action learning sets where newlyqualified nurses will reflect on their practice, receive peer support and gain new perspectives on real life issues beyond their perceptorship period. "We trust in the quality of education at LSBU. We believethat the team will deliver valuable insights and the planning needed to provide the best level of professional and clinical support to enable our newly qualified workforce to transition into their registered roles," said WalterBurog, Clinical Practice Facilitator for Preceptorship at UCLH and part-time MA Practice Education student at LSBU. This collaborationis further proof of LSBU's significant expertise and impactful research intoallied health professionals, nursing and midwifery, which received high quality ratings for impact in the Research Excellence Framework 2014. The LSBU team consists of Professor Baillie, Gary Francisand Stephen Thompson. The bid was supported by LSBU's Business Development Manager for Health and Social Care Peter Benson.